June 13, 1942 - News From The Fronts. 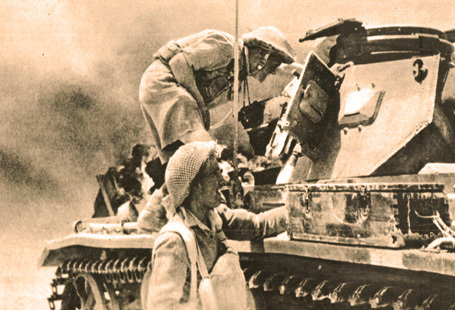 June 13, 1942 - Fighting in North Africa, Rommel aiming for Tobruk. News of Anglo-Russian Pact. Thousands more U.S. troops arrive in Northern Ireland. Russian Army attacking Germans at Sebastopol and Kharkov. Japanese troops land on Kiska in Aleutian Islands. V-Mail is inaugurated and a big Rubber drive starts at Midnight. News for this day in 1942 covered the war on a number of fronts. Reports from London told of intense fighting in North Africa, with German forces aiming at Tobruk in Libya. Several thousand more U.S. troops landed in Northern Ireland with reports of no submarine attacks en route. The U.S. Army introduced the new design of helmet, abandoning the old one used during World War 1. News was also reported of the signing of the Anglo-Russian pact. From neutral Stockholm came sparse reports from the Eastern Front, but word of Russian attacks on Sebastopol and Kharkov in an attempt to drive the German army out of the area were revealed. From New York and Washington it was learned that the Japanese had landed on Kiska in the Aleutian Islands. It was viewed as a face-saving measure by Tokyo in lieu of the crippling loses from the battles of Midway and The Coral Sea, even though the Aleutian Islands were not viewed as an important strategic gain. Still, it made for a propaganda tool, as it meant the Japanese had landed in North America. This day in 1942 also marked the 43rd anniversary of Gen. Douglas MacArthur's entry into West Point and much was made of the promise by MacArthur to return to The Philippines. It was also announced that, as of midnight, a huge rubber drive was inaugurated and everyone in the U.S. was urged to turn in rubber goods for the war effort. Today also marked the inauguration of V-Mail. And that's what happened on this June 13th in 1942 as reported by NBC's News Of The World.